In Japanese and Okinawan cooking, kelp is a very important ingredient. This is because we use it to make dashi (broth) and also in many different dishes. In the far north of Japan, Hokkaido prefecture produces quality kelp and exports it as far as China. 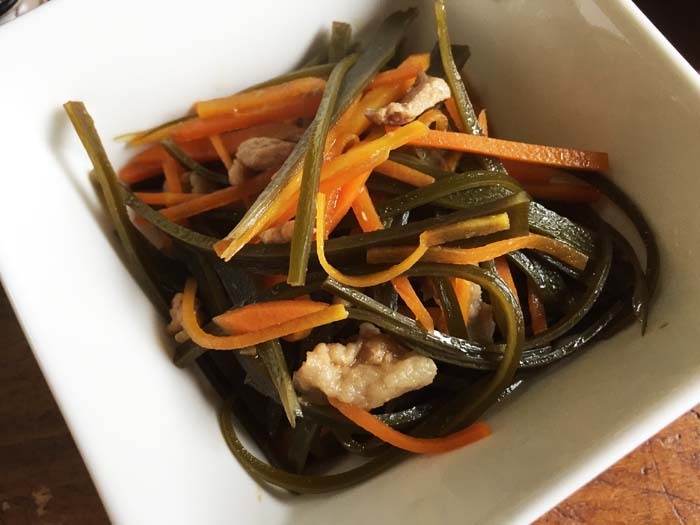 The ships used to stop by Okinawa, so Okinawa has many dishes that use kelp. My mother used to say if I ate a lot of kelp, I would have beautiful hair. She might have said it to make me eat kelp but actually kelp is really good for your hair; it’s rich in minerals, calcium and iron. And it’s low in calories! This particular dish is a popular kelp dish on Okinawa. 1. Heat the oil in a saucepan and cook the pork. Once the pork changes color, add the awamori. 2. Add kelp and carrot and mix well. 3. Add water and dashi powder, then add soy sauce, mirin and sugar and mix all the ingredients gently. 4. Cook for 20 minutes to cook through and reduce the broth. Facebook: facebook.com/cooking.school.with.nao Tel: 098-955-5311 Address: 1414-61 Sobe, Yomitan Village, Okinawa 904-0304. Closed on Sundays.